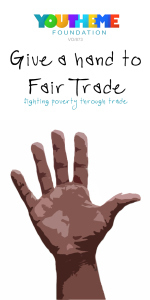 Youtheme Foundation supports youth and international development work. We are inspired by the values of hope, compassion, dignity, solidarity and subsidiarity as provided by the Gospel and the Catholic Social Teaching. What guides us is the conviction that every young person should be able to live his/her life to the full. This in turn provides us with a solid value base towards the development of both our projects throughout the world, and the strengthening our relationships with our collaborators on the field. 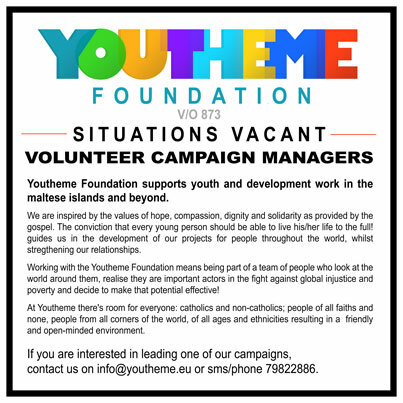 Working with the Youtheme Foundation means being part of a team of people who look at the world around them, realise they are important actors in the fight against global injustice and poverty and decide to transform that potential into effective action! At Youtheme there’s room for everyone: catholics and non-catholics; people of all faiths and none, people from all corners of the world, of all ages and ethnicity resulting in a friendly and open-minded environment. contact us on info@youtheme.eu or sms/phone 79822886.